A few years ago, the film Lage Raho Munnabhai had taken the Indian entertainment industry by a storm: its sole USP being Gandhi-ism. In a lucid and highly palatable manner, the film brought forth the relevance of Gandhi-ism in the modern world. The film's director, Rajkumar Hirani, became a hero overnight in the entire tinsel town. Like Hirani, there are many who still believe that in Mahatma Gandhi's ideology lies the mantra of survival, they are of the opinion that Gandhi-ism is like a magic potion that will help the present world take on the toughest of challenges. Sailesh Kumar Bandyopadhyay is one of them. To him, Mahatma Gandhi is God, Gandhi-ism a religion. 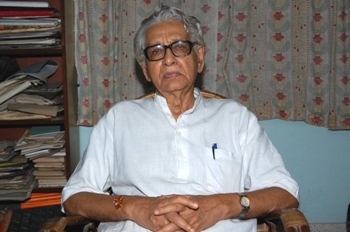 Bandyopadhyay is the eastern zone in-charge of the Khadi and Village Industries Commission and former secretary Gandhi Smarak Nidhi. His honesty and integrity are part of the Khadi Commission folklore so much so that even after his retirement, he was specially summoned by the Prime Minister's Office to be part of the KVIC. Bandyopadhyay agreed on the condition that his service will strictly be voluntary. He firmly believes that the Khadi movement alone can offer solutions to two knottiest problems of the present times: global warming and economic meltdown. All your life, you have never used anything else but Khadi. From drapes to handkerchiefs, whatever you use are made of khaddar. . . In my youth, I was overwhelmingly inspired by Gandhiji's ideology. His method of reviving Swadeshi industries through Khadi astounded me. I got so influenced by his speeches that I started turning to hand-woven textiles. By using Khadi I try to contribute in a humble way to the movement launched by the Father of the Nation. Don't you find it difficult when so many other options are available in the market? No. Consumerism is a state of mind. How far will you go depends on no one else but yourself. Even when I go to the market to buy provisions, I try to buy Indian products only. For instance, I would buy Neem toothpaste or Dabur soap. I avoid paying to the multinationals as much as possible (Smiles). This is not to say that I have something against them but as an Indian I feel we should try and strengthen our industries first. How does KVIC operate in the villages? The Khadi and Village Industries Commission (ministry of macro, small and medium enterprises) is a statutory body established by an Act of Parliament (No. 61 of 1956, as amended by act no. 12 of 1987 and Act No.10 of 2006). In April 1957, it took over the work of former All India Khadi and Village Industries Board. Service industry: This includes village industries' coordination. Before starting any project, KVIC first surveys the village, identifies already existing small and medium indigenous industries in the area, takes them under its purview and nurtures and develops it. Does KVIC make electronic goods as well? We have recently introduced e-charkha. Each e-charkha generates power and is capable of lighting one rural household: say, four bulbs, at a time. It is an interesting concept. We are trying to modify and better it for more extensive use in future. Can you imagine a 15-metre long cloth passing through a finger ring and weighing merely 10 gm per square metre? I am referring to the hand spun, hand-woven muslin made by thousands of skilled artisans of rural India. But aren't Khadi products too costly? Yes, they are. All hand-woven things are. But if we want to give credit to the efforts put in by the artisan, the cost won't seem too much. How can Khadi products help counter global warming? Khadi products, as you know, are bio-degradable. Though no one is taking the issue seriously, global warming is sure to pose a serious threat to our existence. Rampant use of synthetic and plastic materials are polluting our environment beyond repair. This is high time we opted for Khadi, even if it means spending that extra penny. KVIC also promotes creation of non-oil source of energy which is sure to lead us on to a greener future. Use of Khadi has a dual advantage. It will strengthen our economy as also protect our environment from further damage. What is the total budget allocated for KVIC? We get about Rs 700-750 crore (Rs 7 to Rs 7.5 billion) a year. We try to manage with this much. However, more often than not, there is a shortfall. During former Finance Minister P Chidambaram's tenure, talks were on for a $150-million grant from the Asian Development Bank. We hope to get it any time. That grant will help us immensely. How far has KVIC achieved its goal? Ours is a marathon. Till date, we have taken a few sprints, so to say. We still have a long way, a very long way to go. The most daunting challenge is marketing Khadi products. Though we do have a network, it is still not strong enough to effectively distribute our products among the masses. With multinationals breathing down our neck all the time, ensuring purchases for Khadi products seems to be a mammoth task for us. In each KVIC meeting, we focus on this issue and try to find a solution. Chinese products too pose a serious threat to us. Their prices are too low compared to ours. Buoyed by effective marketing and networking, they often eat into our consumer market. KVIC is always striving to tide over this problem. Last but not least, KVIC has still not been able to penetrate well into the villages in north-eastern India. We don't get responsible people to work there, nor do we get good response from the villagers. We are in the process of formulating plans that would help us explore those areas better. We hope to achieve a breakthrough soon.